A catastrophic fire has engulfed Notre Dame Cathedral in Paris, threatening one of the greatest architectural treasures of the Western world. Source: ABC News. 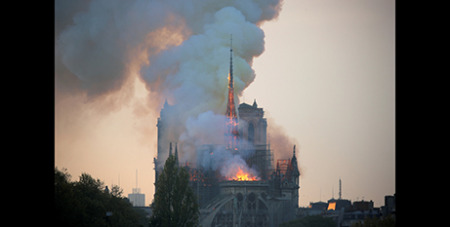 Paris Fire Chief Jean-Claude Gallet said it was unclear if city firefighters would be able to keep the fire from spreading to the cathedral’s second tower and belfry, causing more destruction. It was not immediately clear what caused the fire, which drew crowds of people to nearby squares as a huge plume of smoke wafted across the city and ash fell over a large area. Notre Dame spokesman Andre Finot said the blaze was likely to bring the entire wooden frame of the cathedral down, and the vault of the edifice could be threatened too. “Everything is burning, nothing will remain from the frame,” he told French media. Situated on the Ile de la Cite, an island in the Seine River, the cathedral’s architecture is famous for, among other things, its many gargoyles and its iconic flying buttresses. Its priceless treasures also include a Catholic relic, the Crown of Thorns, which is only occasionally displayed, including on Fridays during Lent. The Vatican said it was praying for firefighters “and those who are doing everything possible to confront this dramatic situation”.